Our sponsor, Love2Reward, offers £20 shopping vouchers for the senders of the best anecdotes and jokes in each issue. The vouchers can be redeemed at more than 75 big name stores - that's more than 19,000 shops. Email your entry now to editor@call-centre-europe.com. Here is the latest selection...and our thanks go to the senders. You could be a winner! 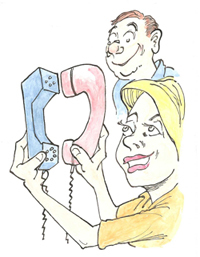 Email your anecdotes and jokes to the Editor, Paul Liptrot, at editor@call-centre-europe.com. Or post or fax to Paul Liptrot, Editor, Call Centre Europe, P.O. Box 220, Walton-on-Thames, Surrey KT12 1YQ. Fax: 01932 240294. (We always respect requests for anonymity - but we will need your name and address for the gift vouchers). “Starship Enterprise, Uhura here. Can you hold please? Captain, there is a transmission coming in on hailing frequency seven, do you want it on screen? “If you are surrounded by sea you are an Island. If you don't have sea all round you, you are incontinent” – Wayne, aged 7. “Sharks are ugly and mean, and have big teeth, just like Emily. She's not my friend no more” – Kylie, aged 6. “I like mermaids. They are beautiful, and I like their shiny tails. How do mermaids get pregnant?” – Helen, aged 6. “Some fish are dangerous. Jellyfish can sting. Electric eels can give you a shock. They have to live in caves under the sea where I think they have to plug themselves into chargers” – Christopher, aged 7. Why do they lock the doors on petrol station toilets? Are they afraid someone will clean them? Being British is about driving a German car to an Irish pub for a Belgian been and on your way home buying an Indian curry or a Turkish kebab and watch shows made in America on a Japanese-made television. She promptly unplugged the TV and threw out all my beer. It takes less than a minute. Work this out as you read. Be sure you don’t read the bottom until you’ve worked it out! This is not one of those waste of time things, it’s fun. 5 If you have already had your birthday this year add 1758... If you haven’t, add 1757. 6 Now subtract the four digit year that you were born. You should have a three-digit number. The first digit of this was your original number (i.e. how many times you want to go out to restaurants in a week.) The next two numbers are your age! More information from: 0845 077 7709 and www.hsgv.co.uk At Love2Reward we can help you manage all aspect of any reward, motivation or incentive scheme you may be thinking about, or are currently running. We have 3 great gift vouchers for shopping the high street, travelling the world or leisure time activities, plus a complete on-line reward management scheme all backed by a portfolio or support services and 20 years experience.